The idibu dashboard page is an optional feature that provides a suite of widgets. These are global, and individual widgets can be switched on and off for your users, depending on the needs of your business and workflow. When the dashboard is enabled, it is accessed by clicking the ID icon in the top left of the screen. If you wish to return to this page at any point, simply click the 'id' icon in the navigation bar in the top left hand corner. Need to know more about the navigation bar? All the features we discuss here are optional. They exist as 'widgets' which can be activated and deactivated by the colleague who is your idibu account administrator. So don't panic if you can't see any of them on your account! If you feel that one of these features would benefit you, then discuss this with your account administrator. 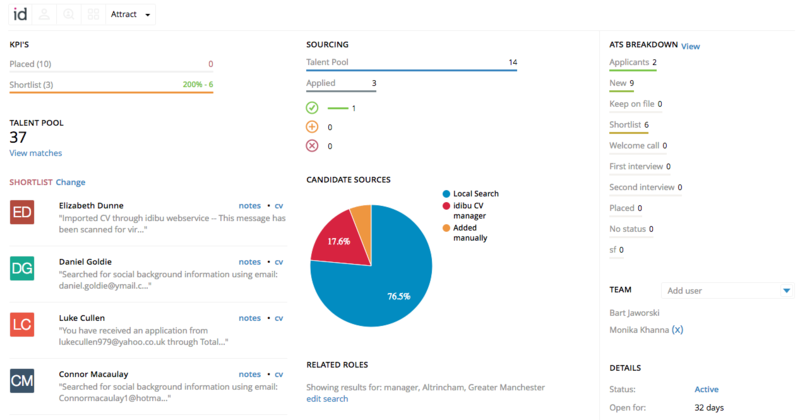 When you first sync the vacancy you've created inside your CRM, the 'Talent Pool' feature activates an instant search for candidate's that could be a suitable match for your role based on the job title. 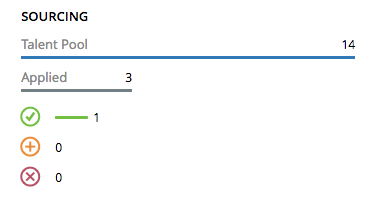 To see these results, click 'View matches'. 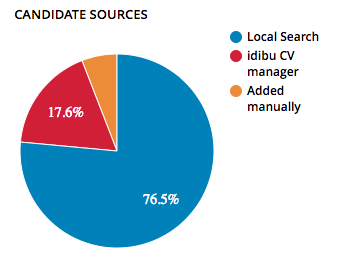 This will not only take you to a list of those candidates, but allow you to perform more detailed searches of the candidates you have sourced inside idibu using our local search feature. For more information about the options available take a look at this article regarding local search. There are two ways you can pass candidates from idibu into your CRM. 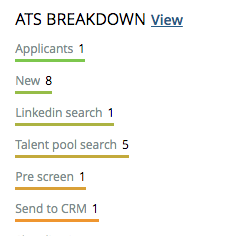 The ATS widget on the home page allows you to see how many candidates are allocated to each status, and has a 'View' button which is a quick link to the idibu candidates page. From the main idibu account you can set sourcing KPIs you wish to work to for a specific role. These link directly to custom status's created in the ATS widget. Again, this is only relevant if you are doing any time of pre-screening or applicant sifting before passing the qualified candidates into your CRM system. You can see what portion of candidates have been sourced via your idibu Talent Pool vs direct applications. You’ll also have stats as to how many applicants you have rejected, kept on file or progressed using the traffic light system. If you want to see the sources in more detail, the sourcing pit chart gives you a breakdown as to exactly where your candidates have been sourced from. Want to send an email or SMS to candidates at a particular stage in your ATS screening? You can do so from the overview page simply by selecting the relevant ATS status. (You can also email and SMS a selection of candidates from the 'Candidates' page). The related roles widget allows you to search for similar vacancies that exist in your idibu account. This means that not only can you gain faster access to previously sourced candidates who are a strong match, but also add them in bulk.